Interior vehicle antennas allow your amplifier system to communicate the enhanced signal to and from your phone/device inside a car, truck, van, RV, boat, and EMS vehicle. Wireless antennas offer highest mobile, multi-user support for a no-wire connection between your phone and booster. Wired antennas are single-user solutions for directly connecting your phone and booster while retaining freedom of mobility inside your vehicle. Cradle antennas offer a secure way to pair up your phone and booster for single-user, hands-free calling while conveniently displaying your phone on dashboard. 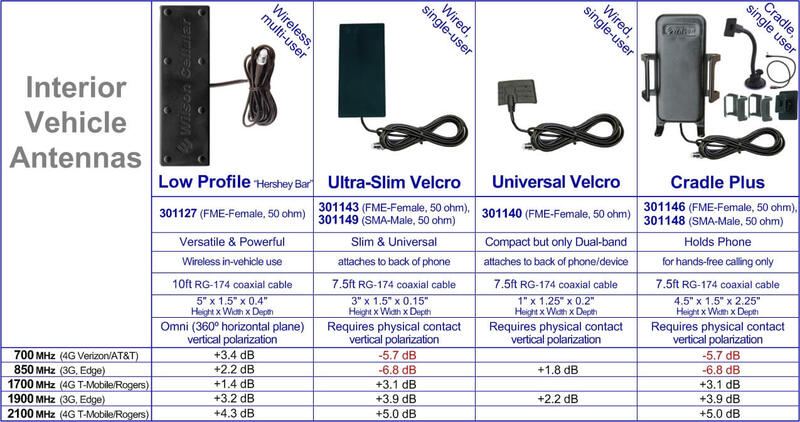 Low Profile “Hershey Bar” antenna (301127) is the wireless solution designed specifically for vehicles. It includes a 3M adhesive for easy mounting and is required to be mounted vertically. It is wide-band with an average dB gain of 2.9dB for North American networks (excluding WiMax). It comes with a 10-foot RG-174 cable with an FME-Female connector. Ultra-Slim antenna (301143 FME, 301149 SMA) is the primary wired, single-device solution to directly connect your phone to booster system. The antenna attachment method works by semi-permanently attaching an adhesive velcro strip to the back of your phone and then connecting the antenna’s velcro side to your phone. The 7.5-foot RG-174 coaxial cable allows mobility while normally using your phone. Universal Velcro antenna (301140) is an alternative wired solution which also requires an adhesive velcro strip on the back of your phone or data card to connect to the antenna. It includes a 7.5-foot RG-174 coaxial cable with FME connector to extend user reach. This antenna is the most compact interior antenna available. It is only dual-band and works for North American 3G/EDGE networks with an average gain of 2dB. Cradle Plus antenna (301146 FME, 301148 SMA) is a vehicle phone holder with a built-in antenna conveniently linking your phone and booster. It installs in your vehicle via the 3M adhesive mount or gooseneck suction cup window mount (both included). It comes with an attached 7.5-foot RG174 cable for extended mounting range, three sets of replaceable arms for nine total cradle sizes, and a 359909 phone adapter to directly connect to the popular MobilePro amplifier.